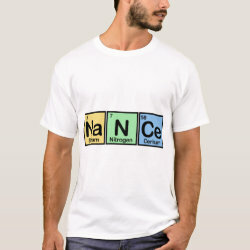 Nance made of Elements Men's American Apparel Fine Jersey Long Sleeve T-Shirt: Back to basics never looked better. The long sleeve version of this top-selling tee by American Apparel is a versatile must-have for every man's wardrobe. Wear it to work or play, or dress it up with a sports coat. Select a design from our marketplace or customize it to make it uniquely yours! Check out other products with this design or view all apparel.